Published: March 12, 2013 at 02:00 p.m. 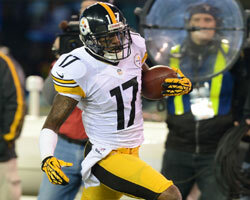 Updated: March 18, 2013 at 06:22 a.m.
Around the League's positional free-agent preview series continues at running back. We've already handled pass rushers, interior defensive linemen, and our Top 85 overall free agents. We listed each player with the team they played for in 2012 and ranked them according to who we'd want to sign, not who will make the most money..
Notes: Now this is why I like ranking these positions by tier. There is very little separating Bradshaw from Bush. I changed my order for these top four countless times, but Bradshaw remained on top because he combines a complete game with relative youth. (He's 26.) Injuries are a concern, but Bradshaw is a violent runner who can also excel on passing downs. Effort is never a question with him. He'd work well splitting carries in most systems. Jackson edged out Mendenhall because he's safer. Jackson can handle passing downs and short-yardage situations, even if he's not going to be explosive. The longtime Ram -- who may return to St. Louis -- can be more productive with fewer touches. Just don't expect him to help for more than a season or two. Mendenhall is the biggest boom or bust option here. Injuries and attitude are question marks, but he's the best candidate on this list to carry the ball 250 times or more. Bush, still only 28, has evolved into a true pro. He's a perfect passing down back with versatility. (As long as he's willing to accept that role.) Teams like the Lions and Bengals make sense for him. Notes: Wells is a disappointing first-round pick who could still help a team looking for a short-yardage back. I stubbornly still see flashes of potential from Jones. He stayed healthy enough in 2012 and isn't a terrible low-cost backup option with potential to explode for a game or two off the bench. It's hard to imagine Woodhead out of New England, but he's a quick player that can do a little bit of everything. Turner would be best used in small doses after getting cut by the Falcons. In theory, he would have a role like Brandon Jacobs used to in New York. In reality, he's no longer a great short-yardage back. Stephens-Howling is a terrific special teamer who was far better than his numbers indicate when he was asked to start for the Cardinals. He's similar to Woodhead, but could carry the ball more. Notes: I just couldn't bring myself to include Greene in a tier labeled "intriguing" although he was running harder by the end of last season. Jennings showed flashes of potential in Jacksonville, but could never keep it going. Hillis was on the cover of Madden two years ago. This is a thing that happened. Takeaway: Fans should never be allowed to vote for anything. Benson is a nice option as an injury replacement for teams in camp. Forsett, Hightower, and Scott are all solid third-down options. Hightower was a nice player before his injury issues. He's worth a look. Brown and Jacobs may fall out of the league. There's no need to overpay for running backs in free agency, especially when none of these players will solve a running game. The top four options are all capable of sharing the load, but not taking over a running game. After that, most of these signings are for depth. Mendenhall has the biggest ceiling of any player available, but it's a bad sign Mike Tomlin couldn't get through to him. Jackson would be a great extra piece on a title contender like the Patriots. Still, running back is a position for the young. It's smarter to draft a player in the middle rounds rather than sign most of this list. 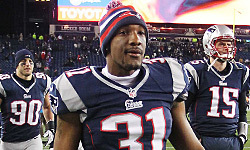 New England Patriots: There's room for a veteran to pair with Stevan Ridley and Shane Vereen. New York Jets: What don't the Jets need on offense? Cincinnati Bengals: Marvin Lewis wants someone more explosive to pair with BenJarvus Green-Ellis. Indianapolis Colts: They like Vick Ballard, but there's room for help. Pittsburgh Steelers: Like most teams, they are more likely to fill their need through the draft. New York Giants: They aren't a team that is afraid to pay for running backs. Atlanta Falcons: Jacquizz Rodgers needs a tag team partner. Oakland Raiders: They only have two running backs on the roster: Darren McFadden and Jeremy Stewart. Dallas Cowboys: Cowboys VP Stephen Jones has talked about wanting to supplement DeMarco Murray. Detroit Lions: The Reggie Bush rumors make a lot of sense. St. Louis Rams: Steven Jackson's most likely landing spot is probably a return home.